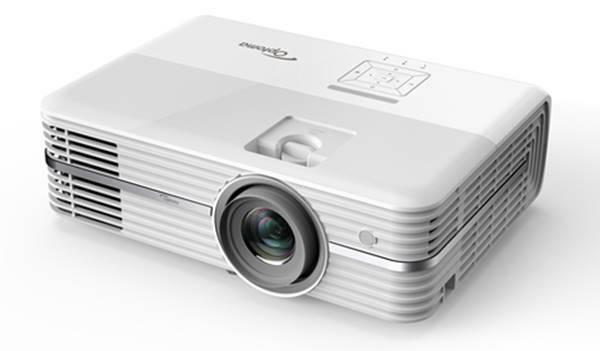 Aside from its short throw, which helps it stand out from the crowd, the Optoma TW610ST has the distinction of being both a fairly typical 1280x800 DLP-based projector by today's leading edge standards, and a distinct improvement over what counted as typical not very long ago. Among the leading edge features that you won't find in most older models, including many that are still available, is an HDMI port, 3D ready capability, and a 3100 lumen rating for brightness (although the measured brightness was a bit lower on our tests). The combination, along with better than par data image quality, helps make the TW610ST a particularly attractive choice for $999. Short Throw. The advantage of a short throw lens, of course, is that it lets you project a large image from a short distance. This is particularly useful in small rooms and in situations where a standard throw projector would have to sit far enough from the screen that it would be hard to avoid shadows, whether from objects or from people in the audience. Optoma says that at the 1280x800 native resolution with 16:10 aspect ratio, the TW610ST can throw an image ranging from 44" diagonal at 1.6 feet to 223" diagonal at 8.2 feet. Our review tests were consistent with the claim, with a 69" diagonal image from 2.5 feet and a 79" diagonal image from 3 feet. Suitably Bright. We measured the TW610ST's brightness in its brightest mode at 2423 lumens. That is a 22% shortfall from its 3100 lumen rating. However, even 2423 lumens is more than bright enough for the 79" diagonal image we used for our tests to stand up to the level of ambient light in most offices. For dimmer lighting, the projector also has a selection of other presets, with brightness levels as low as 576 lumens. Reasonably good brightness uniformity. Short throw projectors sometimes have problems maintaining uniform brightness across the entire screen, so it's not unusual that the TW610ST scored a relatively poor 61% for brightness uniformity. That's enough to see the difference on a solid white or bright colored screen in our tests. However, the brightest and dimmest areas were far enough apart, and the change was gradual enough, so that the difference wasn't at all visible with the screen broken up by text, icons, or other objects. As a practical matter, that translates to acceptable brightness uniformity, despite the score.